Solution B.I offers expertise in the Qlik editor's BI solutions with the QlikView and QlikSense tools. Solution B.I chooses the guided and predictive analysis of the Qlik publisher. 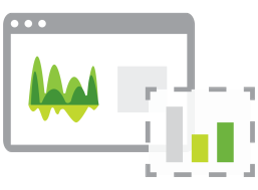 Whatever the job or the need, the powerful QlikView and QlikSense solutions will reveal the hidden richness of your data! 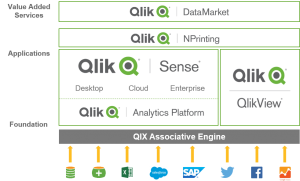 Qlik is a BI discovery tool editor and one of the world leaders in business intelligence, taking part in the industry’s race to the top, alongside Tableau and Microsoft. 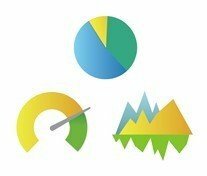 Qlik is composed of two tools for meeting current BI challenges: QlikView and QlikSense. Principes Principles of QlikView and QlikSense applications. 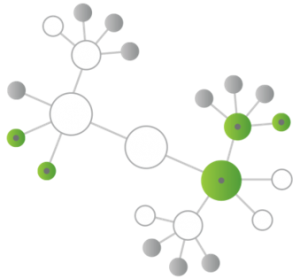 QlikView, the leading platform for BI-enabled market applications. Used to develop and deploy powerful applications, analytically structured to facilitate the exploration and discovery of “business” data. Allows everyone to create interactive, easily modifiable visualizations and explore them even more intuitively. Facilitating the exploration of the data, whatever the volume, through an innovative and associative engine. 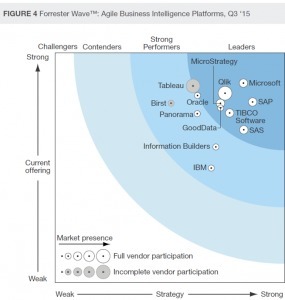 According to the Forrester report, Qlik is once again in the running of visionary and comprehensive tools. Would you like more information? Don’t hesitate to contact our certified Qlik experts, who will guide you and present you with the full potential of this tool for your business.